Cristin Tierney is pleased to announce an exhibition of new paintings by Jorge Tacla entitled Altered Remains, on view from October 27 until December 10, 2011. The opening will take place on Thursday, October 27th, from 6:00 pm until 8:00 pm. The artist will be present. In his newest body of work Tacla engages the idea of social rupture, situating it at the crux of a new architecture that arises in the wake of natural and man-made disasters. Tacla perceives the devastation that results from such events as an opportunity to investigate structural systems that would otherwise remain unseen. In a painting such as Altered Remains 1, the composition is derived from images of the 2010 earthquake in Haiti. Tacla’s deliberate evocation of such a horrific event, experienced by most of us only through news reports and media outlets, forces us to consider our relationship to that catastrophe. Influenced by the writings of the forensic anthropologist Roxana Ferllini and the Hungarian psychoanalyst Sándor Ferenczi, the artist effectively translates the pictorial space of the canvas into a psychological one. To signify such unsettled worlds he uses an obsessive pictorial language, repeating the same gesture in the same space many times until the visual register is analogous to the trauma that prompts it. , Tacla studied at the Escuela de Bellas Artes, Universidad de Chile in Santiago, before moving to New York in 1981. His most recent exhibitions include Sharjah Biennial 10 in Sharjah, UAE, Hidden Identity, González y González, in Santiago, Chile, and the Dublin Contemporary 2011 in Dublin, Ireland. Tacla is a recipient of the John Simon Guggenheim Memorial Foundation Fellowship (1988) and a New York Foundation of the Arts Grant (1987, 1991) and he has exhibited internationally since the early eighties. Other notable exhibitions have included Jorge Tacla: Papel at the Galería Animal, Santiago, Chile in 2010 and The Man Who Fell to Earth at the 798 Biennale in Beijing, China in 2009. His most recent catalogue, published in 2010 by Galería Animal, features an essay by Francesca Pietropaolo. Other recent publications include Jorge Tacla: Pinturas/Paintings, which includes an essay by Donald Kuspit and Raul Zamudio Taylor, printed in 2008. 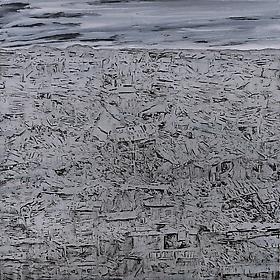 His work is included in many public collections, including the Drawing Center, New York, High Museum of Art, Atlanta, the Milwaukee Art Museum, the Museo de Arte Moderno, Mexico City, and the Museo de la Memoria y Derechos Humanos, Santiago, Chile.